With many of our friends participating in the B2B ride on Saturday, and not a lot going on with the racing calendar, Mike and I headed up to the house in Maine on Friday to do an epic mountain ride on Saturday. We started what I refer to as the "around the block" ride in Gorham, NH just after 9:00 am. Our route took us up over Pinkham Notch to start out, and then down into Bartlett, NH, past an already packed Storyland. In Bartlett, we turned onto Rte 302 for a ways, before diverting onto West Side Rd, and riding past Diana's Baths and the beautiful Cathedral Ledges. Soon, we were on the very scenic Passaconaway Rd, paralleling the Kancamagus Highway. The nice thing about this route is the lack of traffic! And, there is a very cool covered bridge crossing once you approach the Kanc. From here, we rode up the Kanc for a few miles before turning to climb Bear Notch. Up and over we went. Coming down, I had a car that decided to stay far enough behind me the whole way so that I didn't have to worry about them. Given that I was going between 32 and 35 mph the entire way, this was a really nice gesture by the driver, whom I thanked as they passed at the bottom of the descent. Not often we have courteous drivers like that ;-). We stopped at the store in Bartlett to refuel before heading up to Crawford Notch. The last time I did this portion of the ride, it was into a decidedly nasty headwind. We lucked out, and managed a tail wind the whole way up. Mike stopped a few times to take some pictures, but given what was coming, I decided it was best to just keep moving, and suffering. As I was climbing the steepest pitch of Crawford Notch at about 5.6 mph, I was thinking about the dichotomy of climbing and descending that same pitch - 5.6 going up and close to 50 mph headed down (I think Mike has hit 53 mph descending). The good news though is that I felt better climbing the Notch on this trip than I had a few years ago - no pedaling squares this time ;-). With 3 notches down, we still had one of the toughest to come, and it starts right on the heels of finishing Crawford. We turned off of 302, and started the ascent up Jefferson Notch. It is important to note that this climb is on an unmaintained DIRT road - gravel - soft shoulders - steep climbing... Get the picture? In places, I would stand to try and relieve the stress on my back and knees, only to have the rear tire spin in the dirt. It was a slog going up this climb. What made it worse? The a$$hole in a Volvo coming DOWN the [narrow - close to one lane] road doing Mach 10. He didn't slow down when he passed Mike, and I started yelling. He came to a stop when he reached me (after I had already had to stop 'cause he put me in the soft shoulder) - since his window was wide open, I yelled at him to slow down. His response? "No". Then I decided to call him an a$$hole - made me feel better ;-). So much for the courteous drivers (of which we DID have a couple on Jefferson). We didn't linger at the top of the Notch (too much traffic driving way too fast for our liking). 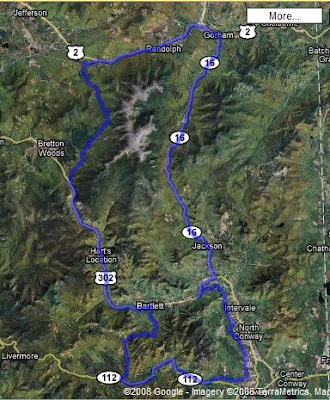 From Jefferson, there was really only one more [short] 8% climb before getting back into Gorham. Unfortunately, we now had to ride into a headwind! At least the end of the ride was all downhill - we were pretty glad to finally get back to the car, and to some food! That is SOME ride profile! I *think* I've done some of those. Nice! When is training camp this year? (I vote for the week of June 30th) I would be game for a notch ride.